:: Anastasia DipBrow Pomade in Blonde – I’ve seen a few people talking about this new range from rulers of the Brow Kingdom, Anastasia. I imagine it to be fairly similar in texture and performance to my beloved Make Up For Ever Aqua Brow – and there’s only one way to find out. I’ve got my eye on the blonde shade, which you can find on Cult Beauty for £15. :: Tom Ford Tobacco Vanille Eau de Parfum – It seems quite possible that I have a physical inability to walk anywhere near a Tom Ford counter without going to give this a wistful sniff. Tobacco. Vanilla. YES. I’ve wanted this for years now, but I’ll be damned if I’m shelling out £210 for 100ml. 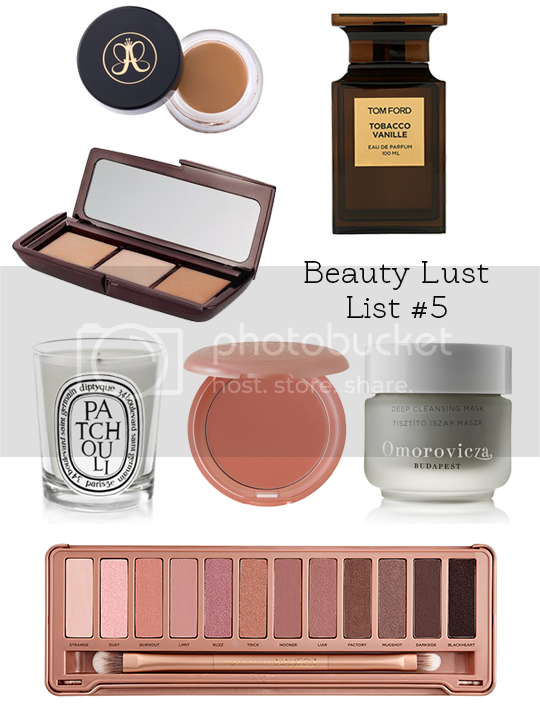 :: Hourglass Ambient Lighting Palette – This palette seems to have generated something of a fetish among many bloggers, but blimey it does look lovely. Packed full of ‘photoluminescent technology’, the Ambient Lighting palette claims to diffuse light and create a soft, radiant glow. Phwwooaarr. Worth £56 though…? :: Diptyque Patchouli Candle – Ok, so candles aren’t strictly beauty but developing a penchant for Diptyque is sort of a rite-of-passage for any beauty blogger, isn’t it? I had a mini version of this particular one which I loved, but it’s long gone now. Pure patchouli, as the name suggests, super herbal and delicious. I’d love to pick up one of the larger jars, and it’s actually a little cheaper than most of the 190g candles at £32 (most of them are £40). :: Stila Convertible Colour in Gerbera – Another beauty blogger fave, of course. I can’t believe I’ve still never tried one of the Convertible Colours from Stila before – it’s a brand I really like so goodness knows why I’ve never got round to adding one of these to my arsenal. I think Gerbera is the colour that’s calling to me the most. At £16 for a generous amount of product, that’s multi-use too, I shouldn’t keep putting it off. :: Omorovicza Deep Cleansing Mask – I had a sample size of this which I used very, very sparingly to drag it out as long as possible. I absolutely loved it. Rich in calcium and magnesium, this pricey little pot is excellent for clearing congested pores and brightening the complexion. But, at £54, do I really need it when I have the bargainous likes of Amie Spring Clean in my stash? :: Urban Decay Naked 3 Palette – Well… I couldn’t not, right? I have Naked 1 and Naked 2, and now that the world and his wife own Naked 3 I’m starting to think I’m going to have to cave into that one too. I actually bought this for my sister for Christmas and *almost* didn’t give it to her (sorry Rachel). The pinky, rosy undertones prevalent in Naked 3 appeal to me on levels that Naked 1 and 2 can’t even begin to compete with. Be miiiine.